The North Devon Biosphere Reserve partnership's bid to establish a Nature Improvement Area based on the Torridge river catchment has been chosen by Defra as one of 12 national pilots for important landscape scale wildlife schemes across England. It is a partnership project within the North Devon UNESCO Biosphere Reserve and will run until April 2015. Devon Wildlife Trust is the NIA’s lead partner and at least 16 other project partners are making active contributions. 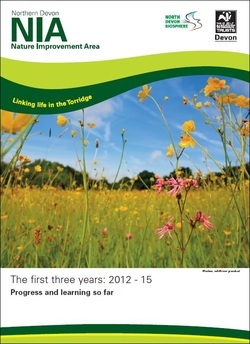 You can download a 16 page summary report of the progress and learning from Northern Devon NIA for the period April 2012 to March 2015 by clicking the cover image (right) or the Pdf icon (Below). Between 2012 and 2015 the Project secured £3.5 million towards the following objectives. 1/ Develop a more robust and coherent Torridge catchment ecosystem, maintaining, enhancing, restoring, re-creating and reconnecting a mosaic of key habitats, primarily Culm grassland and semi-natural woodland. 2/ Realise the Torridge catchment’s potential to deliver high quality ecosystem services, particularly water quality, flood risk and carbon. 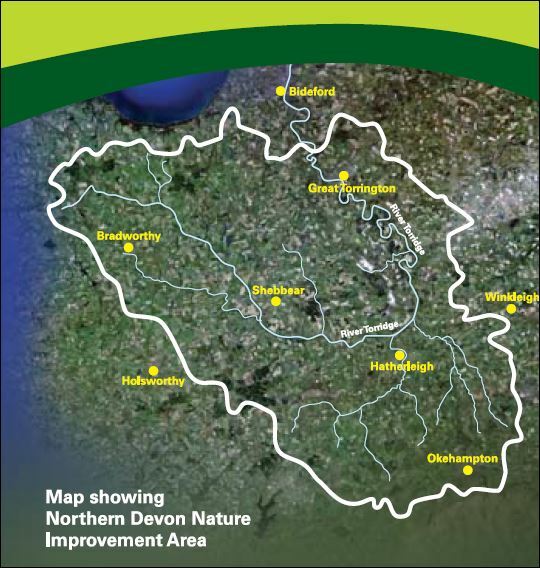 3/ Enable communities to understand and value the role of nature in delivering a range of ecosystem services, through active participation and engagement, reconnecting people with their local river and wider environment. 4/ Provide an integrated and co-ordinated advisory service to landowners. 5/ Realise the benefits of ecosystem services by supporting supply and demand in local markets, primarily woodfuel.